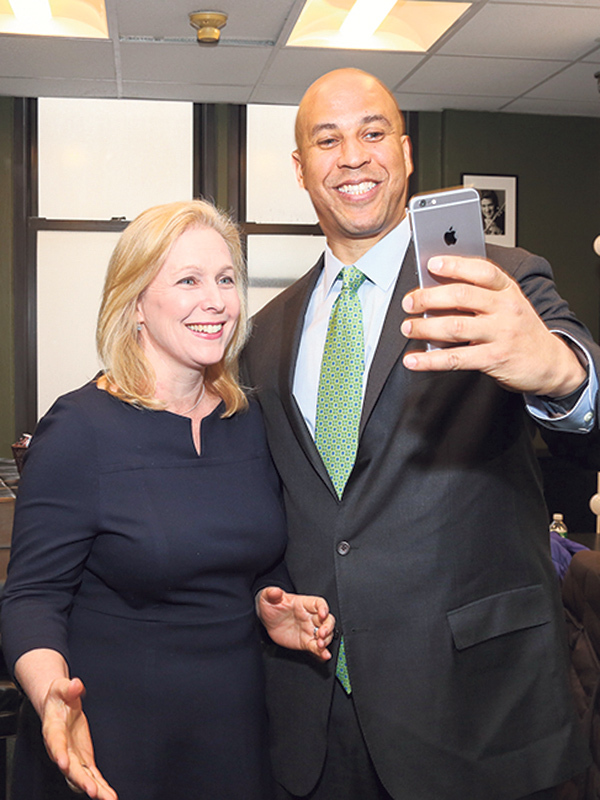 Sen. Cory Booker takes a selfie with Sen. Kirsten Gillibrand, moderator of a Feb. 21 discussion at the 92nd Street Y in Manhattan. Reporting on a trip last month to Israel, Saudi Arabia, and Turkey, Sen. Cory Booker (D-NJ) said Donald Trump’s anti-Muslim rhetoric is troubling to officials in all three countries. Booker and Sen. Kirsten Gillibrand (D-NY), who led the congressional delegation that visited the region, discussed their trip during a Feb. 21 appearance at Manhattan’s 92nd Street Y.
Booker said he was “sobered and almost saddened” by what he heard from Palestinian officials in Bethlehem, Saudi Arabian women, and high-level leaders in Turkey. “They all were asking us concerned questions about how we were treating Muslim Americans and would this country be changing its policy,” said Booker. “We had to insist the stuff that was coming out of the Republican primaries was not American policy, nor would it ever be if we had our way. “We should all be thinking about the words that come out of our mouths, and this applies to the primaries right now,” he warned. Booker’s remarks about the billionaire Republican candidate came after a lengthy discussion of Booker’s new book, United: Thoughts on Finding Common Ground and Advancing the Common Good, published last month by Ballantine Bantam Dell. In United he describes growing up as a child of suburban privilege and his later exposure to inner-city crime and poverty in the projects and streets of Newark, where he was elected city council member and then mayor before becoming a senator in 2013. Booker told his 600-person audience that those experiences compelled him to dedicate much of his time in the Senate to forging bipartisan relationships, especially in the area of reforming the criminal justice system. “We live in our nation with tragically different justice systems, depending on where you are located. When I was a student at Stanford and Yale I saw tons of druggies, but nobody stopped and frisked anyone coming home from a frat party and nobody was raiding dorms,” he said. “It is a very different situation” from the Newark housing project where he lived when he was a councilman and mayor, he said, where police cracked down heavily on marijuana smokers. 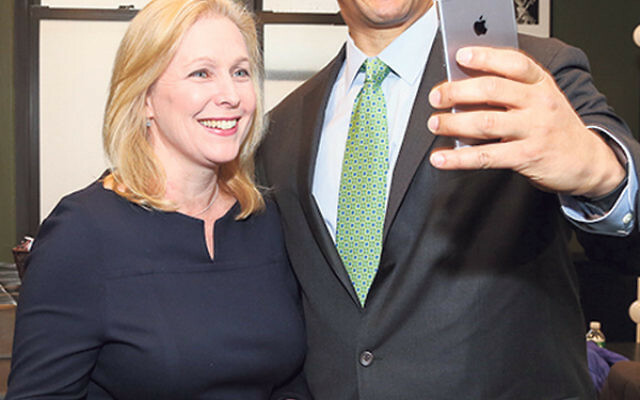 New Jersey’s junior senator was one of eight legislators on the Jan. 3-9 trip to the Middle East led by Gillibrand.